What's Your Favorite Local Holiday Tradition? Every place celebrates the holidays a little bit differently. Today, we want to know about your very favorite (and distinctive) local holiday traditions. 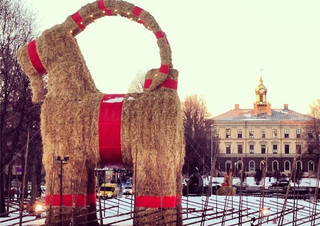 Maybe you want to tell us a story that's gotten a little (unfairly) overshadowed by Santa Claus, or maybe you want to show us and explain a very specific kind of decoration (like this 40-foot tall Yule Goat that they build annually in Gävle, Sweden). Is there a regional dish that you make over the holidays that you can't find anywhere else? Tell us all about your favorite festive traditions — and just where we would go to find them — in the comments now.